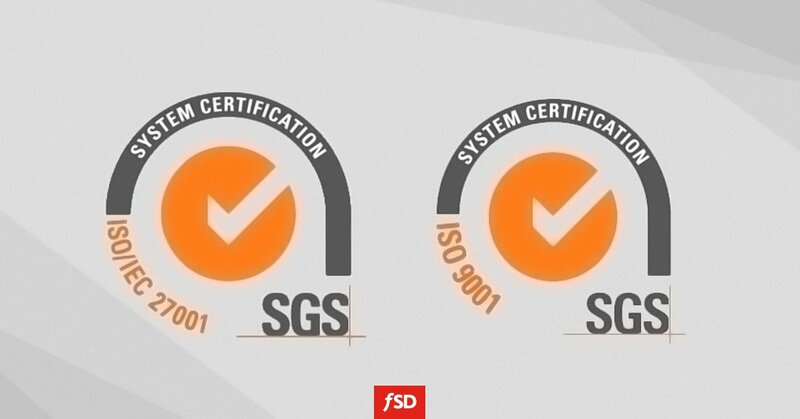 FSD has successfully completed the certification of company certificates 27001 and 9001. ISO/IEC 27001:2013 is an information security standard that was published in September 2013. It supersedes ISO/IEC 27001:2005, and was published by the International Organization for Standardization (ISO) and the International Electrotechnical Commission (IEC) under the joint ISO and IEC subcommittee, ISO/IEC JTC 1/SC 27. It is a specification for an information security management system (ISMS). Organizations which meet the standard may be certified compliant by an independent and accredited certification body on successful completion of a formal compliance audit. ISO 9001 is the international standard that specifies requirements for a quality management system (QMS). Organizations use the standard to demonstrate the ability that they consistently provide products and services that meet customer and regulatory requirements. Certification company which was selected for this procedure is a renowned Swiss certification company SGS.